Since 1998, family owned Anacapa Heating & Air has provided exceptional heating and air conditioning services in Malibu. Having served thousands of residential and commercial clients throughout Ventura County, we've earned a reputation for offering high-quality heating and air conditioning systems, expert installations, accurate diagnostics, reliable repairs, and thorough maintenance tune-ups. And since we focus on delivering superior service, we can rely more on long-term client satisfaction and customer referrals rather than a huge marketing budget. Additionally, with a lower overhead, we're able to offer more competitive pricing than our competitors. Call Anacapa Heating & Air today to tell us about your heating and cooling needs. We offer heating and air conditioning service in Malibu and surrounding areas Monday through Friday, from 8am to 5pm, but we also make ourselves available 7 days a week to handle emergency heating and air conditioning repair requests. While there are many reasons to choose Anacapa Heating & Air, one of the most compelling is our designation as a Carrier Factory Authorized Dealer. Carrier is considered one of the best heating and air conditioning brands in the industry, and to earn their factory endorsement, a heating and air conditioning company must demonstrate a level of service that is consistent with their commitment to excellence. Additionally, Carrier Factory Authorized Dealers are required to meet Carrier's rigorous standards for liability coverage, local licensing, technician training and qualifications, and customer satisfaction. As a result, just a small percentage of Carrier dealers, and an even smaller percentage of heating and air conditioning companies, are able to call themselves a Carrier Factory Authorized Dealer. By working with a Carrier Factory Authorized Dealer, property owners in Malibu can trust that they are working with a highly qualified heating and air conditioning company that provides personalized heating and cooling solutions for optimal comfort and value specific to their unique set of needs. Keep reading to learn more about the HVAC services requested most frequently among our Malibu customers. If this is the first time you are buying an air conditioning system, you should know that it is a fairly important investment. It will not only be responsible for keeping your home or business cool and comfortable, but can also have an impact on the value and appeal of your property, particularly in coastal Malibu where air conditioning is not always automatically added to a home's central heating system. If you've been through the process of purchasing an air conditioner before, then you already know that this is a major purchasing decision. At Anacapa Heating & Air, we're here to help guide you through the process of selecting the right air conditioning equipment for your needs and ensure that the system is properly designed and installed for maximum effectiveness and efficiency. 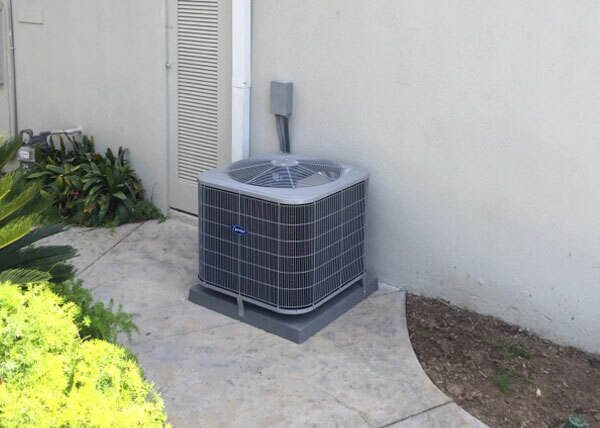 We've installed and replaced thousands of air conditioning systems throughout Malibu, Thousand Oaks, Oxnard, Ventura, and the surrounding areas over the last 20 years and become known for our commitment to customer satisfaction. In fact, we GUARANTEE 100% SATISFACTION for one full year from the date of installation: If for any reason you are dissatisfied with your Carrier air conditioner, we will correct the problems you are having with it or remove the equipment and refund your purchase price. Call today to set up a free in-home or on-site estimate for a new AC system installation in the Malibu area. We'll not only provide personalized recommendations and an upfront quote, but also review available financing options and rebates. Call (805) 485-6333 to request ac service in or near Malibu, California. We are on-call 7 days a week to provide emergency ac repairs and have a dedicated team of factory-trained, NATE-certified HVAC technicians. Out of respect for your time, we'll provide you with a two-hour appointment window and call you ahead of time if our technician is expected to run late. Once on site, our technician will take the time to meet with you to understand your cooling issues and thoroughly inspect and troubleshoot your system to identify the underlying problem. We provide upfront, flat-rate pricing and keep our service vehicles well stocked with the most commonly needed parts and materials so that the majority of air conditioner repairs are completed on the same visit. We repair and service all major HVAC brands and also provide factory authorized warranty repairs for Carrier air conditioners. Book your air conditioner service calls in or near Malibu today. For every service call, we charge a $69 diagnostic fee, which can be applied toward the cost of your repairs. If your furnace has suddenly stopped working or you have noticed that it isn't warming your house as effectively as it used to, it's time to call a qualified furnace repair company like Anacapa Heating & Air. Our technicians have years of experience and receive ongoing, in-depth training to know how to best assess, diagnose and repair nearly any heating issue for most major makes and models, including variable-speed furnaces, heat pumps, hybrid furnace systems, and ductless mini-splits. 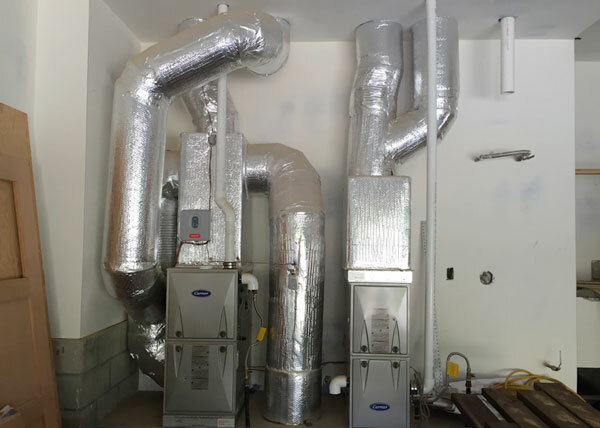 Call us today to schedule an appointment with one of our NATE certified technicians for reliable and affordable furnace repair and service in Malibu. 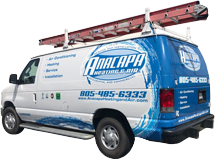 Anacapa Heating & Air provides personalized, cost-effective heating solutions to customers throughout the Malibu area. By listening to your concerns, evaluating the size and layout of your property, and reviewing your habits and recent energy bills, we can design a solution that allows you to meet indoor heating goals at a price that works with your budget. As a Carrier Factory Authorized Dealer, we give you access to a wide range of heating options, from top-of-the-line furnaces to meet the needs of your entire home or building, to affordably priced ductless heating systems for a single room. Moreover, we stand behind every new heater installation with a 100% satisfaction guarantee for one full year. Click here to learn more or simply give us a call to set up your complimentary, no-obligation consultation and estimate. Just like a vehicle requires regular tune-ups, your heating and air conditioning system also requires regularly scheduled tune-ups to keep it running reliably, safely, and efficiently. Similarly, how often your equipment needs a tune-up depends on the make and model of your unit as well as your level of usage. For example, a commercial air conditioning system that is used 365 days a year might require a tune up four times a year; while a Malibu homeowner who enjoys the cool ocean breeze most of the year likely only needs an AC tune-up once a year, typically in the spring. Our heating and cooling experts are readily available to help our customers throughout the Malibu area to determine what maintenance schedule best meets their needs and provide high-quality tune-ups at an affordable price. We offer 20-point inspections and tune-ups for all furnace and air conditioner brands, including Carrier, Bryant, Day & Night, Trane, Rheem, Goodman, Honeywell, York, Payne, and Lennox. Our furnace and AC tune-ups are just $79 and can be scheduled at any time of the year. For the best value in heating and air conditioning preventative maintenance services, we also welcome those in or near Malibu to join our Preventative Maintenance Club. This Club is open to both residential and commercial clients and personalized to their needs. Not only does it help keep you up to date on your recommended heating and air conditioning maintenance schedule, but it also offers valuable benefits such as priority scheduling and 10% off for parts and materials for repairs. Call us today to learn more!